The average number of words per search in the United States in March was nearly 3.2 words and it has been growing for some time [up from just under 2.9 in July-08]. This is a far cry from our original limitations of "shoes" in order to now search for and find a pair of "nike air jordans." None of this should come as a shock. Search engines are constantly tweaking their algorithms, striving to deliver the best and most relevant search results to their users. According to Matt Cutts, the head of Google's Webspam team, Google tends to make a change to their core search algorithm at least once a day. The consequence of these continual improvements is user trust. Google, Bing and Yahoo!, the big three search engines, all auto detect your location and include local results if they are relevant to your query. Too a large extent, this makes adding extra geographic qualifiers unnecessary. However, there are still a handful of users who may add a specific neighborhood or cross street to their search, hoping to narrow the results accordingly. When building your business profile, take advantage of any sections that allow for extra geographic detail such as areas served, nearest cross streets or neighborhoods. 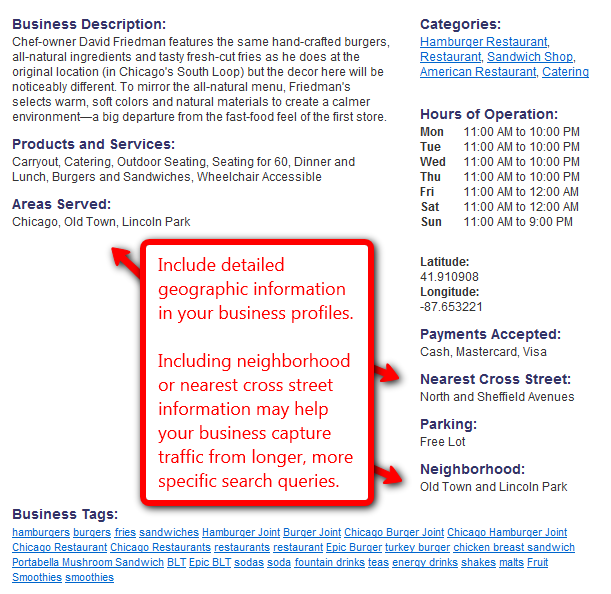 If the profile doesn't have special sections designated for geographic info, craft a small paragraph that you can include at the end of your business description. Include nearby neighborhoods, nearest cross streets and notable landmarks that may be nearby. Just as Comscore noted, the days of searching 'shoes' when you are looking for 'nike air jordans' are quickly coming to an end. Companies whose business profiles consist of nothing more than name, address, phone number and perhaps a category are losing traffic to more detailed profiles that capture traffic from longer searches. Imagine, for a second, a fictional auto repair shop. Let's call it Joe's Auto Shop. His business profile is basic, consisting of only a name, address, phone number and a business category, which is "auto repair shop". Our friend Joe might get a little bit of traffic from people in his area searching "auto shop," or "auto repair." However, he probably isn't ranking for ANY of the specific services he offers such as "transmission repair," "brake repair," "tire rotation," "Oil changing service," "engine rebuilding," "radiator flushing," "wheel alignment," etc. Suffice it to say, our friend Joe is missing the boat when it comes to longer searches. Business profiles often include special sections for listing products, brands and services. Some even let you select multiple categories. There is absolutely no reason to leave these sections blank. If you own a shoe store, list Nike, Adidas, Reebok and New Balance as brands. Note that you sell dress shoes, sneakers, sandals and boots. Mention that you carry laces, shoe polish and offer shoe repair. 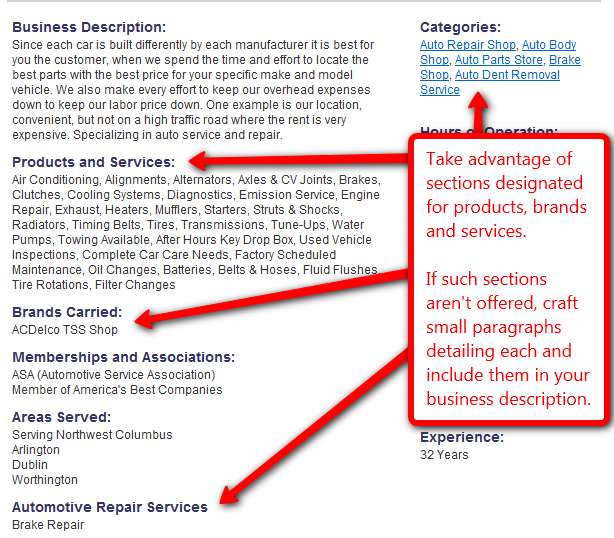 If the business profile doesn't have designated sections for products, brands and services, craft a small paragraph detailing each and include them in your business description. As searches get longer, they also get more varied. After all, more words equals more word combinations. Over time, users will move away from broader queries and jump right to specifics at the point of search. In order to adapt, small business owners need to pay attention to details, optimizing their profiles for the increasing long tail of local search.